Glac Nan Sgadan is a remote West Coast Highland self-catering estate sleeping 10+. 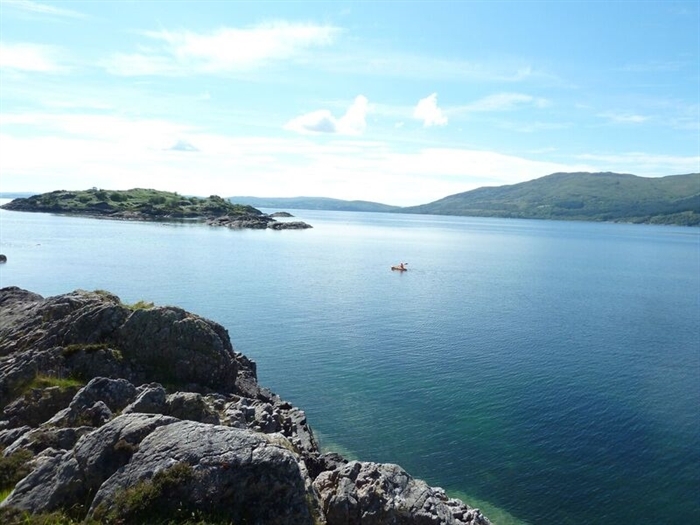 An enchanting oasis of tranquillity on the remote peninsula of Knoydart, this magnificent house ideally located for a truly relaxing holiday. 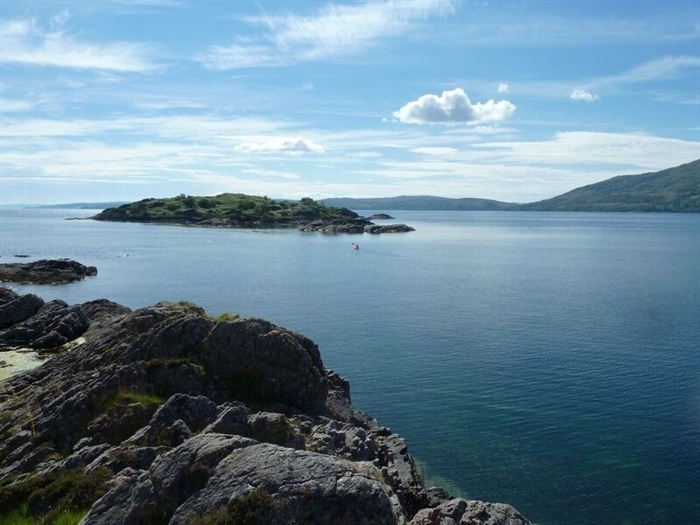 Glac Nan Sgadan is a remote West Coast Highland self-catering estate of approximately 1500 acres, which takes in approximately 1.5 miles of sea frontage complete with a newly built traditional stone lodge. Half of the land is under natural regeneration and the other half is connected to the lands of Knoydart. Glac Nan Sgadan is set on the shores of Loch Hourn under the majestic Munro of Ladhar Bheinn, and enjoys breath taking views across the sea to the picturesque village of Arnisdale and Beinn Sgritheall, another mountain of over 3,000ft on the skyline. The lodge has been built to exacting modern specifications including Sky TV, mobile phone signal access and high-speed broadband, so you can communicate and keep on top of business if you wish. Glac Nan Sgadan can accommodate 10 people. With 3 bedrooms’ downstairs (2 double rooms and a twin room), and plenty of floor space upstairs for 4 extra mattresses and bedding provided. There is adequate space for many more should larger groups wish to stay. The comfortable bedrooms truly are a retreat at night and all have superb views of Loch Hourn and surrounding hills. 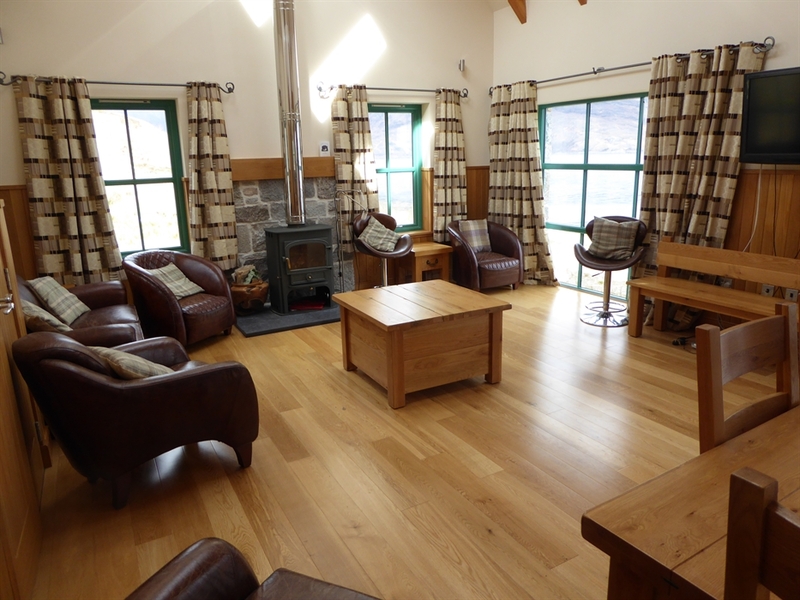 The lodge is fully furnished, decorated and maintained to an excellent standard. The large, open plan living area of the house provides a great area to cook, socialise, relax and enjoy the views. For extra peace and quiet, there is an upstairs closed off living area with stunning views of the loch through full height windows. The house also offers a games room and provides darts, a pool table and table tennis table. Low season – Nov – March. £225 per night. High season – Apr – Sep. £250 per night. Xmas /New Year/Valentines Day – £300 per night.